One day I told myself that I needed to document our lives. There is something different about us. A simple 35mm point-and shoot camera with a built-in flash helped me document the critical moments that were occurring in and around my life. I just started shooting rolls and rolls of film. By capturing the habits, associations, indecencies, deviances, and freedoms we have experienced, I am able to record the moments that define us. The photographs are crude and raunchy but show an experience that can't be displayed in any other way." Shawn Campbell has produced a book that for some of us that might not be American per say, embodies the ‘American Experience’, what we imagine a young adults life looks like in this country, what we envision from TV and movies. In a gritty book dedicated to documenting these experiences of love, freedom, silliness, drunken nights etc, Campbell lets us in to a culture and people we might have not being able to experience for ourselves. 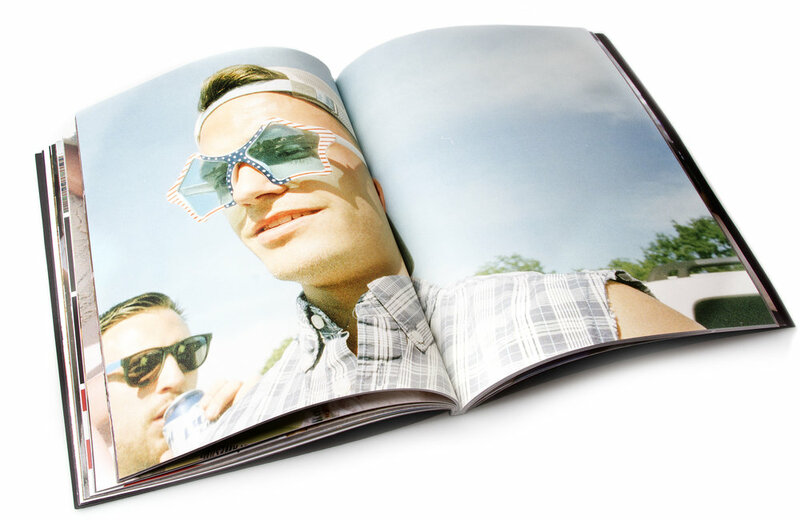 he books layout might seem messy but it does a perfect job in re creating the feeling the images provide – which is indeed a messy, fun moment, that has many faces and is juxtapose to other experiences. The layout is diverse and changes from each page, creating little stories within the spreads, creating scenes that we can experience all together as a group, in addition to paying attention to each picture individually. The layout is almost as if we were looking at a reality show, looking at the same time frame from different angels and different point of views, yet they all happen simultaneously, or at least that what it feels like. The images themselves range from outrageous moments to soft and intimate flashes. The type of photography is of course reminiscing of people such as Nan Goldin who documented her close friends in the intimate life style they shared. It feels as if the photographer and the camera are an integral part of the community and scene at the time. The camera flourishes the experience and enhances the moment by it’s presence. like the book cover and the overall size of the book. It felt right, it felt big and kind of obnoxious in a sense, but that made the book even better. It went well with the images, and by the end of the book, you didn’t realize the size, and it became more comfortable to use.